With the LiveTrak L-12, you can finally mix, record, and monitor with a single piece of gear. It’s the only digital console that lets you mix your live performance and record up to 12 discrete channels all while providing five individual custom headphone mixes. LiveTrak’s 12 discrete channels (eight mono plus two stereo) have a 3 band mid parametric EQ and 16 built in send effects. Its eight mono channels also have a dedicated compressor. 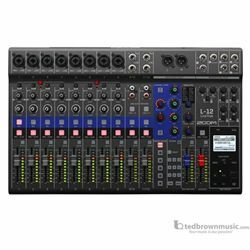 With all these controls plus its 12-segment LED metering, the L-12 offers just what you need for intuitive mixing. LiveTrak lets you record 12 discrete tracks up to 24-bit/96 kHz WAV audio to an SD card while simultaneously mixing your live show. Tracks are recorded pre EQ and effects, so they can be transferred to your favorite DAW for further mixing and editing.